What is this pipeline project all about? The “Access Northeast” Project will expand Spectra Energy’s Algonquin Gas Transmission pipeline, and includes a proposed high-pressure 30-inch gas pipeline that will run through ten towns in Massachusetts: Milford, Bellingham, Medway, Millis, Franklin, Norfolk, Walpole, Sharon, Stoughton, and Canton. Loop extension that includes Sharon, among other towns. Fracked gas is packed into the pipelines at high pressure, increasing the likelihood of leaks, ruptures and/or explosions. Major effects of these accidents vary from injuries and sustained fire to environmental contamination and health impacts from volatile chemicals. Watch video below. There are hundreds of hazardous chemicals involved. There are over 600 chemicals used in the process of fracking gas, including EDCs (endocrine disrupting chemicals), known carcinogens and neurotoxins. Chemicals contained in the gas traveling through pipelines are known to off-gas at compressor stations. The American Academy of Pediatrics is recommending we use less natural gas because of the health risks it poses to children through its contribution to climate change. Natural gas (which is mostly methane) contributes to global warming. Massachusetts has passed the Global Warming Solutions Act, which calls for an 80% reduction in greenhouse gas emissions by 2050. This is a $3 billion dollar project that will be paid for through surcharges on residential electric bills. $3 billion could be spent on clean energy solutions, like solar panels and wind turbines. 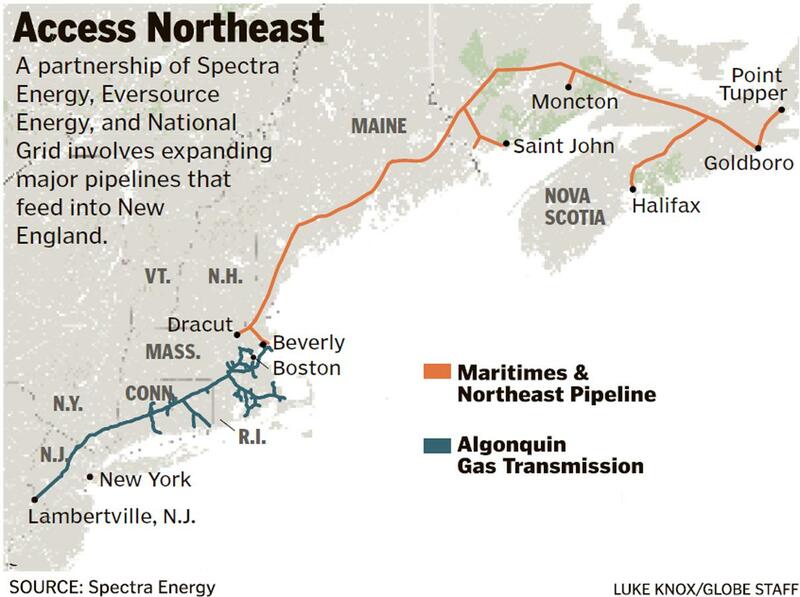 Why does Spectra want to build the Northeast Access Pipeline? Spectra wants to provide more capacity to New England during the winter, but there is extra gas capacity in the summer, which could be stored for use in the winter. We managed supplies successfully during the exceptionally cold winter of 2014-15. MA Attorney General Maura Healey says state can meet energy needs without new pipelines. Click here to read article. With this expansion project, Spectra will have the ability to connect the Algonquin pipeline to the Maritimes and Northeast pipeline, and export gas from Canadian LNG terminals. Exporting gas is projected to cause regional gas prices to rise to international levels. Thanks for featuring this information! There is also an online petition here: https://www.change.org/p/town-administrator-frederic-e-turkington-jr-town-administrator-frederic-e-turkington-jr-town-selectmen-william-a-heitin-joe-roach-and-john-j-mcgrath-no-spectra-gas-pipeline-through-sharon. Please sign it! I ll sign when you fools shut off your gas heat ,clothes dryer,stove gas,fireplace. …..didn t think so. Fact..global warming is not true. If it were do you really think we can control earths climate? In addition, did you know that you will be paying for this thru a surcharge on your electric bill, whether you use it or not? The energy company is poised to make a huge profit off of money that they are getting from the little guy.